There are many reasons why a child might appear to be picky around food. Sometimes your son is just exploring how much he can push against the rules and limits you set, maybe he really dislikes a specific taste or texture, or he finds that trying new things is difficult for him. This is especially true with children between 36 and 48 months of age because, according to the American Academy of Pediatrics, around this age kids start eating more independently, using feeding utensils, and drinking and pouring liquids from open cups. Model eating a wide variety of healthy foods. Combine new foods with others that are well-known and loved, and try to introduce one new item at a time. Expose your kid to a fruit or vegetable garden, or have your 4-year-old go with you to the farmers’ market. Make sure to present food at a comfortably warm temperature. When introducing a new food, encourage exploration. 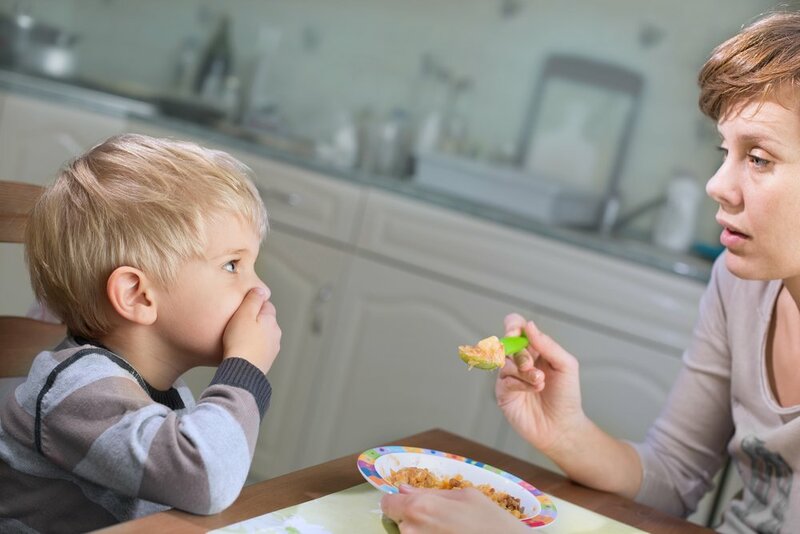 Have your child try touching the food, smelling it, and taking a small bite out of it. Small steps go a long way. Expose your kid to new foods and keep presenting them frequently for a couple of weeks. Researchers suggest that by doing this, it’s most likely your child will learn to accept it. Have your child be your little helper around the kitchen. You can ask him to help with simple supervised tasks while you cook or bake, like mixing and rolling little balls. Make meals interesting and fun. You can try mixing colors and shapes into a plate. Make mealtime a distraction-free moment of communication. Encourage tasting everything on the plate, but don’t make it a rule to clean it off. This makes for a more positive experience, avoids power-struggles, and helps children get in tune with their hunger and fullness cues. Give praise for progress and acknowledge effort.